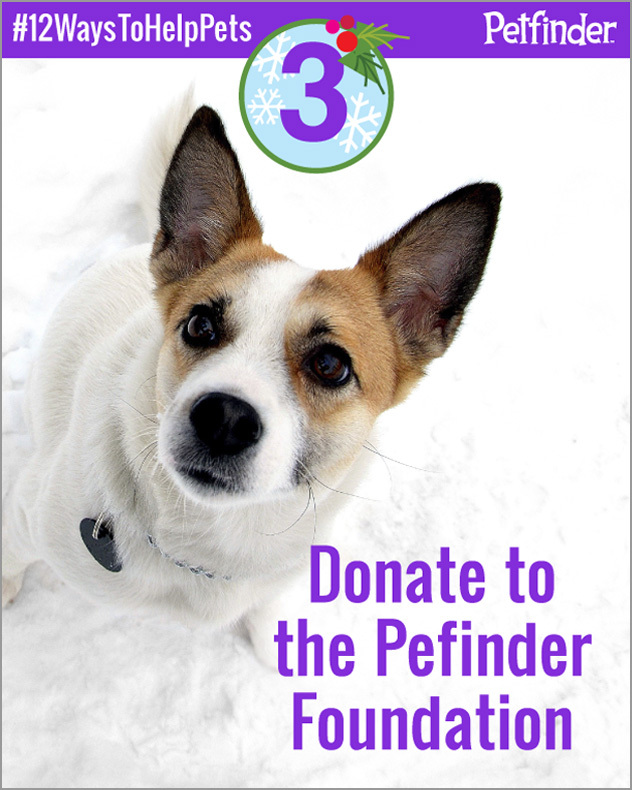 Have you donated to the Petfinder Foundation? Here are their top 10 reasons to consider giving. Read, then take the pledge to help pets for a chance to win! Brandy was adopted from the Santa Maria Valley Humane Society in Santa Maria, CA. It’s a great gift for your favorite pet-lover. Donate in honor of a loved one and we’ll send her or him a beautiful holiday card with a personal letter announcing your gift. You’ll get a free calendar. Gift $50 or more and we’ll send you a certificate redeemable for a free personalized 12-month calendar from Shutterfly.com! You can memorialize a beloved pet. Give in memory of a pet and we’ll send you a charm customized with your pet’s name by our friends at Fuzzy Nation. You can also send us a photo and some remembrances to post to our Pet Memorial Wall. 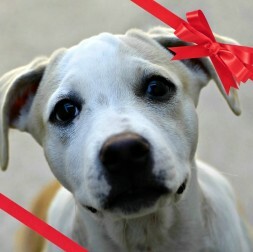 Your gift will help the pets in the greatest need. We offer aid to shelters and rescue groups during times of crisis or disaster. Recently, we helped the survivors of a deadly shelter break-in and a shelter that was hit by a schoolbus. We help pets put their best faces forward. We teach shelter staff and volunteers skills that help pets find homes. Our One Picture Saves a Life program, in which we train shelter workers to take professional-quality pet photos to post online, has saved countless pets like Brandy (read Brandy’s story here). Pin this image to inspire your friends to pledge to help pets! Your donation will go toward pets, not fundraising. Over 90% of every dollar we spend goes toward programs that help homeless pets — not toward advertising or other fundraising or administrative expenses. Check out our blog post, “When You Give to Us, Where Does Your Money Go?” for more info. We have good grades! We have the highest possible ratings from the top independent charity watchdog groups: Charity Navigator, GuideStar and the Better Business Bureau. And we post all our financial documents to our website. Visit our Financials section if you’d like to learn more. You can meet the pets your donation is helping. We ask the shelters and rescue groups we help to tell the stories of the pets whose lives are impacted by our grants. You can read these stories in the adoption groups’ own words, and see pictures of the pets, in our Success Stories section. Our partners help your donation go further. Each year since 2012, our friends at Orvis have matched your donations up to $30,000. We’re also able to help thousands of pets in need thanks to cash and product grants from our partners at the Animal Rescue Site, Boehringer Ingelheim Vetmedica, John Paul Pet, Bissell, Petco, Wahl, KONG, Thundershirt and more. However you decide to help homeless pets, all of us at the Petfinder Foundation would like to wish you and your (two- and four-legged) family a wonderful holiday season and a happy New Year!